The French Lotto takes place three times a week on Mondays, Wednesdays and Saturdays at 7:30pm with €1 million added to the jackpot every time the draw rolls over. You can bet on this draw and win all the same prizes at Lottoland. Instead of entering the official French Lotto draw, you place a bet on the outcome of it. You pick the numbers you think will be drawn in the same way as if you had entered the official lottery draw. At Lottoland, you win the same prize money for each prize tier that the official lottery operator offers, including the jackpot, and you receive your prize money as if you had actually played the official lottery. Choose 5 numbers from 1-50 and 2 further numbers from 1-10. You can also select the QuickPick option (Quick+1) and this automatically select the numbers for you. After this simply click Submit. This will take you through to a checkout – at this stage just click Confirm and proceed to place your bet. A single line costs €3. 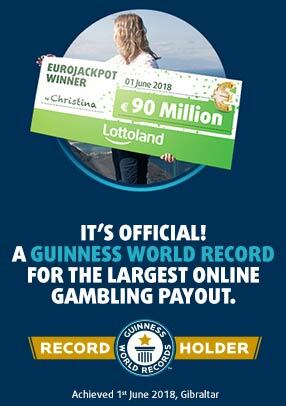 A line with the DoubleJackpot feature costs €6. The DoubleJackpot feature allows you to bet for twice the official lottery jackpot. So, for instance, if the official French Lotto draw is €6m and you bet on the outcome with us and activate the DoubleJackpot feature, you can potentially win €12m. The prizes for all other tiers will remain the same. You will pay double the price of your normal line to activate the DoubleJackpot feature. So, if you wish to bet on French Lotto with this feature you'll pay €6, instead of €3. The French Lottery draw takes place every Monday, Wednesday and Saturday at 7.07pm GMT. When you bet on the outcome of the French Lotto you will be treated as though you entered the official draw and will receive the same main game prizes should you win. The information below is based on the results of the May 28th draw and is provided as a guide only. Yes. You will not be taxed on any winnings for this lottery. The French Lotto takes place 3 times a week with a minimum jackpot of €2 million and a subsequent €1 million added to the jackpot each time, allowing it to grow quite quickly. It also offers great odds of winning any prize at just 1 in 7.6.